Two years ago, I bought Stephen an Amazon ‘Echo’ for his birthday. If you aren’t familiar with this device, it’s sort of ‘Siri’-in-a-can. Constructed with two stacked speakers in a [tasteful] 10-inch tall perforated black metal cylinder, you communicate via Wi-Fi to its database by intoning ‘Alexa’ to wake it up and then asking a question, or making a request. The plan was for it to sit unobtrusively on Stephen’s little cobbler’s bench at his store while he fabricates baubles and bijoux, as it can be linked via Bluetooth to an iPhone’s or iPad’s music library, or it can access Amazon’s music library. But let’s be honest, visions of ‘Robby the Robot’ in ‘Forbidden Planet’ were dancing through my head, and there was plenty of time to get another gift should Stephen give me that ‘Bought this for me?’ look. Surprise, Stephen was also intrigued, but nixed taking it to work, so we put it on the mantle in the room where we end up most of the time. Here’s the reality: ‘Alexa’, even two years out, is still a pretty dumb bunny. ‘Sorry, I didn’t understand the question as asked’. 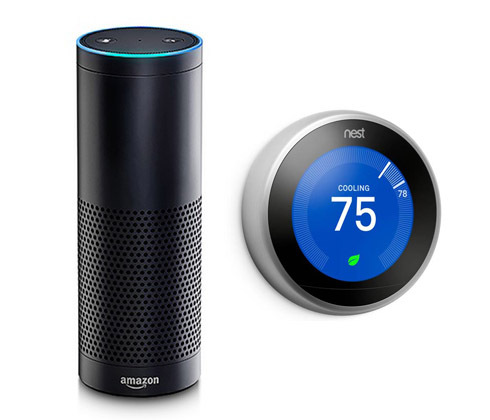 Before Christmas our electric utility company offered a deep discount on the ‘Nest’ brand ‘learning thermostat’, and now smitten with A.I. (minor disappointments notwithstanding), I couldn’t resist. Here the idea is that over time, the device will learn your temperature habits, and eventually take over adjusting the heating and cooling of the house. You can also adjust settings from a mobile phone; I haven’t tried that yet. In addition, it turned up that you can link the ‘Nest’ and ‘Echo’ devices. On several occasions, however, after attempting to simplify word choice and syntax for ‘Alexa’ and still getting ‘I didn’t understand’, I have said (and worse) ‘Alexa, you’re pretty stupid, aren’t you’. I felt really bad (I’m not making this up) and apologized (I’m not making this up). Now, while unpleasantness with ‘Alexa’ has been limited to these few unfortunate exchanges, no way am I turning over the HVAC to her. My, my, next thing you know Alexa will lock you out of the house. Is she related to HAL? Does she know “Bicycle Built for Two?” The voice of HAL was Douglas Rain a very well known Canadian Shakespearean actor – just as a FYI. That made me laugh. Guido gets annoyed when I don’t say thank you to Siri. I mean, really. Friends of HAL are all suspect and should not be talked to if possible.